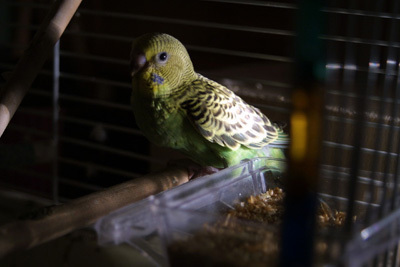 We started with just Marble - she was my daughter's bird. Then we rescued Summer from a dog kennel. Then we adopted Sprite, Kiwi and Lyman from my daughter's friend. Before we knew, we had two females laying eggs in competing nest boxes, and feathers everywhere. That was back in 2006 and 2007. Today we just have Kiwi. 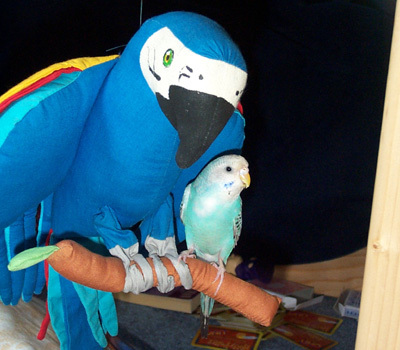 Summer died in August 2010 of natural causes and the rest were given away long ago. Below is a quick look at these birds. 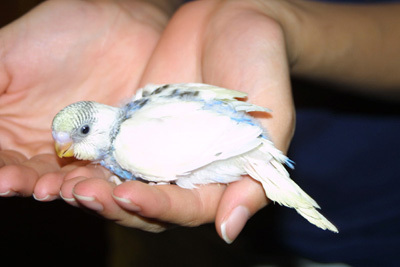 Marble / female - blue with white head and spot on belly. Dark blue tail. Blue cheek spots. She was purchased from a local pet shop. 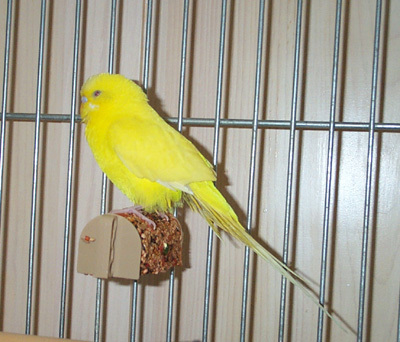 Summer / male - pure yellow. Red eyes and white cheek spots. Summer was rescued from dog kennel. He flew in (crash landed?) while we were there and was in very bad shape. We brought him home and nursed him back to health. He lived 4 more years before passing away in August 2010. 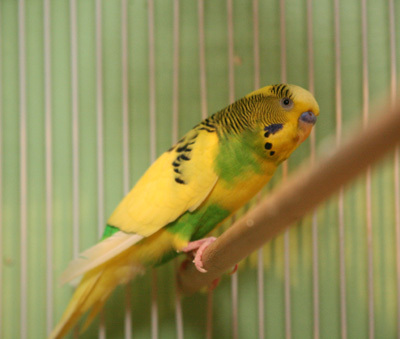 Sprite / female - bright green with a yellow head and blue tail. Blue cheek spots. Sprite, Lyman and Kiwi were adopted together. Lyman / female - olive green with a yellowish head and belly. Blue cheek spots. 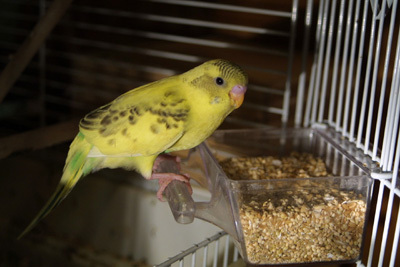 Kiwi / male - light green with yellow spots. Light green tail. One blue and one white cheek spot. 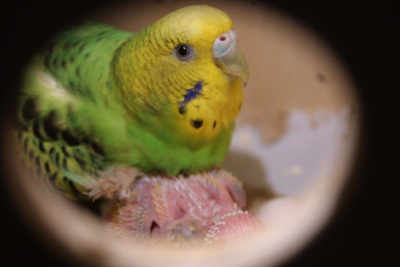 Sprite's first clutch (Kiwi is the father) - hatched 8/31/06, 9/6/06 and 9/7/06. Eggs are normally laid every other day so they would tend to hatch every other day. The large gap between the first 2 is due to some infertile eggs that didn't make it. Clover / female - deep blue. Basil / female - forest green with a blue tail. Blue cheek spots. Mango / male - yellow with some light green spots. Blue cheek spots. Lyman's first clutch (Kiwi is the father) - hatched 9/15/06, 9/17/06 and 9/23/06. 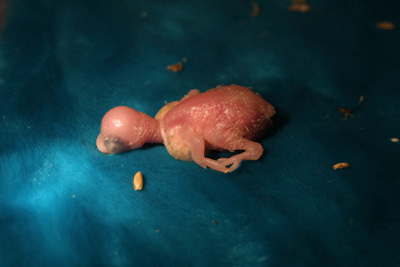 Unfortunately, the second bird (born on 9/17) survived only until 9/29. Yes, Kiwi was a busy guy. Sprite's second clutch (Kiwi is the father) - Six eggs, six hatched between 10/31/06 and 11/2006, one died. Just a bunch of adorable (and noisy!) birds. These five birds look almost identical; I can't tell which is which. 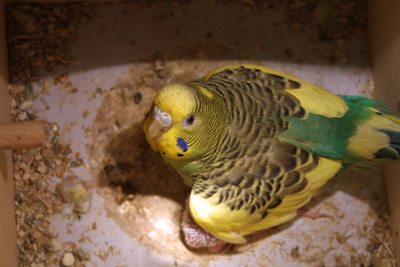 Lyman's second clutch (Kiwi is the father) - hatched between 11/25/06 and 12/2006. Do the math, these birds work fast! There were six eggs, two hatched. 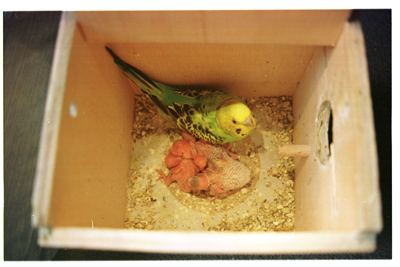 Sprite's third clutch (Kiwi is the father) - I have very few pictures of this clutch from January 2007. Sprite in the nest box with her four hatchlings. 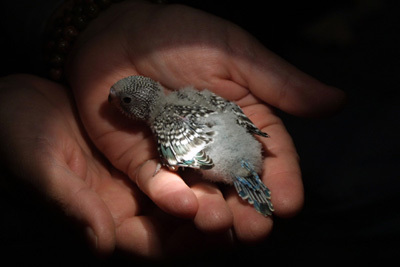 Lyman's third clutch (Summer is the father) - hatched April 2007. Summer gets in on the act. Once again, we have birds that look almost identical. On the left is Lyman sitting on her eggs while Summer does a little preening.